If she was just ‘a pet’… I wouldn’t have cared if my new place had a yard with a sunny spot or not. Or stairs or not. Or a fence or not. I wouldn’t have chosen a neutral couch fabric to disguise her fur. I wouldn’t have vacations that were under 10 days, and I wouldn’t make sure that I got home every night and was available every morning to walk her twice a day. If she was just ‘a pet’… I wouldn’t allow her inside, on the furniture, make her a part of my life, a part of my ‘little family’. She and her brother were supposed to be with me in my twenties, to see me through my singledom, to guide me into marriage and having kids, so that when she retired, she would slow down, take longer naps in the sun, and maybe one day, in her ripe old age of 17 or 18, maybe it would be too tough for her to get up… and she would go peacefully, knowing she had passed on the torch….. that the kid/s the husband would be there to be my guardians now, her job would be done. And she has done her job. Through every move, she’s come along, a trooper… finding every possible escape hatch and small animal to hunt down. And through every breakup, she’s consoled me, crept up next to me while I was curled up in tears, and said nothing but just breathed by my side. She forced me to wake up every day, even if I didn’t want to, and take her out, sometimes scratching at my face with her paw until I would get up and walk her- she would not take “no” for an answer. Her fiestiness and sideways crabwalk made me smile, her persistence and independence made her admirable, her destruction made her a genius. She is beautiful and quaint and lovely and kind, sweet and gentle and crazy and funny. She is not just a pet. To someone like me, someone who is single, who has had a dog for 12 years, a dog that is supposed to live to be 18 because she’s ornery and crazy and loveable like a mini George Burns… with perfect breeding and disease-free lineage going back to her African ancestors in paperwork… she is my family. Every decision, thought, schedule I make involves her. She is always by my side, always in the equation. 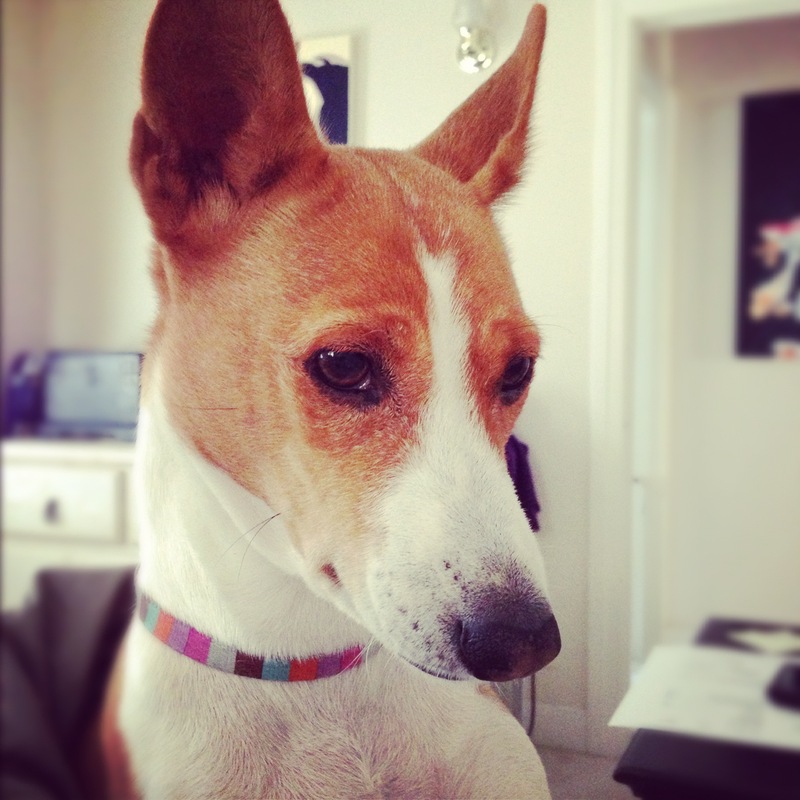 I found out this weekend (four days before I am to leave on my trip to Costa Rica) that my basenji, Halo, has an inoperable nasal tumor. Nasal tumors comprise 1% of canine cancers. 1%. I don’t yet have confirmation yet that is is officially cancer, but the CT scan I viewed confirmed the enormous mass that began in her sinus cavity and has broken through her skull and is pressing against her brain. There is no reason for it, it’s not genetic, it’s not caused by anything. I’ve found a few blogs and videos on it, but there is very little information on the topic. Yes, she has lived 12 years. Fully. She’s done the dog parks, eaten only human-grade food, sipped filtered water, and enjoyed daily walks and belly rubs and cuddle time. I have put Halo on every Christmas card I’ve created the last eleven Christmases. I get stopped in the street by strangers weekly to meet her. I wake up to her each morning. I thank her and her brother every day for finding me and being a part of my life. I thank them for keeping me moving on the days I can’t move, for teaching me how to love so openly, for picking me as their guardian. “How did I get so lucky to have a boy and girl like you?” I ask them every morning when I wake up. I understand that pups have shorter lifespans than people, that they all have to go sometime. But to see my little fireball be reduced to a quieted uncurled-tail fraction of herself, well, it’s just heart-breaking. You see, Halo has been half of a little guardian angel team that has watched over me for twelve years. She is my family. I don’t have a husband. I don’t have kids. I don’t even have a boyfriend or anyone I’m dating. These dogs are the ones I see each day. These are the ones I care for and give and receive love from day in and day out. They are my family. I know for most of you, she’s ‘just a pet’. But for those who know me, and know her well, you know it’s so much more than that. Please keep kind thoughts of her, send positive energy that her suffering is limited, and that I can provide the best possible comfort for her in the upcoming days and months (and hopefully) year/s. Thank you. I totally get it, Jessica. She isn’t just a pet. She is family and so much more. Animals are a huge gift. My animals are my family too and keep me going and comfort me. Lots of light to Halo and you. I’m sorry for what you both are going through.